The versatile Adella Capelet - a steamed velvet Bloodborne inspired mini-cloak; made from steamed velvet and lace trim, it has a massive hood and fastens at the neck with an embroidered frog fastener - throw it on to give any outfit a steampunk vibe! As always, it's only available from Moonmaiden Gothic Clothing!<br> <br> It's shown here with the forthcoming Adella Skirt, the Graveheart Skirt, the Princess Karma Gown and Moonshadow Gofficeia Dress - it goes with anything! The versatile Adella Capelet - a steamed velvet Bloodborne inspired mini-cloak; made from steamed velvet and lace trim, it has a massive hood and fastens at the neck with an embroidered frog fastener - throw it on to give any outfit a steampunk vibe! 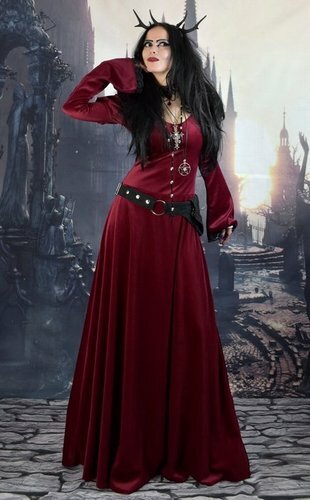 As always, it's only available from Moonmaiden Gothic Clothing! It's shown here with the forthcoming Adella Skirt, the Graveheart Skirt, the Princess Karma Gown and Moonshadow Gofficeia Dress - it goes with anything! Instant Steampunk when you need it!